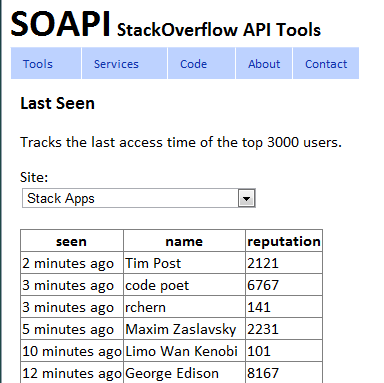 Soapi.LastSeen lists the top 3,000 users of any Stack Exchange site by last access time. GPL - source code in Soapi.CS demos and provided below. Soapi.LastSeen is a web app. Soapi.LastSeen is a simple ASP.Net page written in C# using the Soapi.CS library to demonstrate the parallel paging and integral caching features of Soapi.CS. LastSeen is about as simple as an app can get. It leverages the integral caching and paging capabilities of Soapi.CS as well as the rich domain object model in conjunction with ASP.Net declarative databinding. The core of the app is a simple data source that provides a list of sites and a list of the top 3000 (30 pages) of users for a site. The context is served by a static request cache which will serve api data from memory and being static it will caches for all asp.net sessions ensuring that fresh data is fetched only when the cache duration has expired. Combined with a declaritive page caching, the response times and API request usage are fully economized. Except, that is, for the first person to request the page after the cache has expired. For huge sites like Stack Overflow, a refresh can take up to 15 seconds. For smaller sites like Stack Apps the refresh time is nearly unnoticeable. <asp:DropDownList ID="SitesDropDownList" runat="server" DataTextField="Name" DataValueField="ApiEndpoint"
<asp:GridView ID="GridView1" runat="server" AutoGenerateColumns="False" DataSourceID="UsersDataSource"
And that is it. No code behind. Not the answer you're looking for? Browse other questions tagged app website soapi.cs .